IMPORTANT - Restrictions on use THIS SITE IS RESTRICTED TO SATURDAY ONLY FLYING FOR THE PERIOD 1st APRIL to 1st JULY inclusive. Any competitions held here have to be agreed by the Lake District Park Authority (LDPA) in advance. 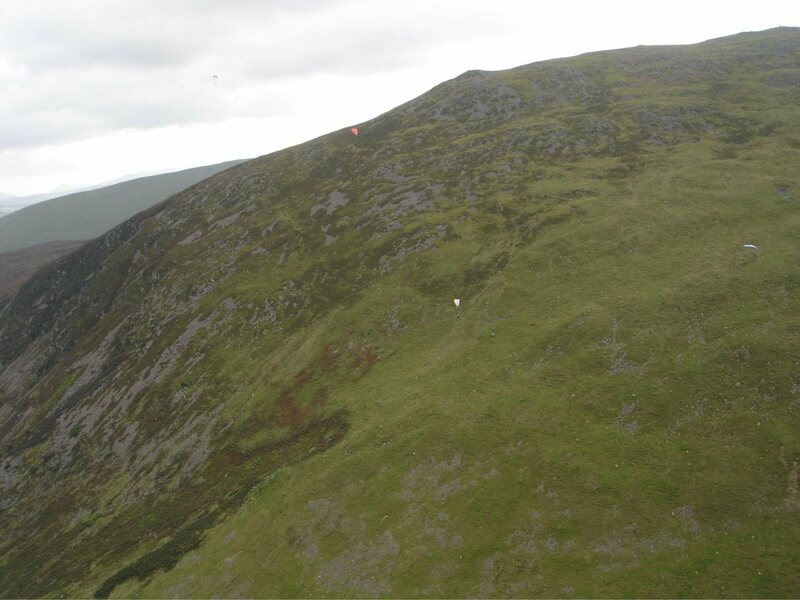 If perigrines are nesting on the crags then keep well clear of this area until well above them at least 1000ft clearance. THE BREEDING SEASON FOR PERIGRINES LASTS FROM APRIL TO END OF JUNE. DO NOT 'SCRATCH' ON THE CLIFFS DURING THESE MONTHS - the RSPB WILL stop us flying this site if we cause distress to any nesting birds! No dogs allowed beyond the area where the cars are parked. 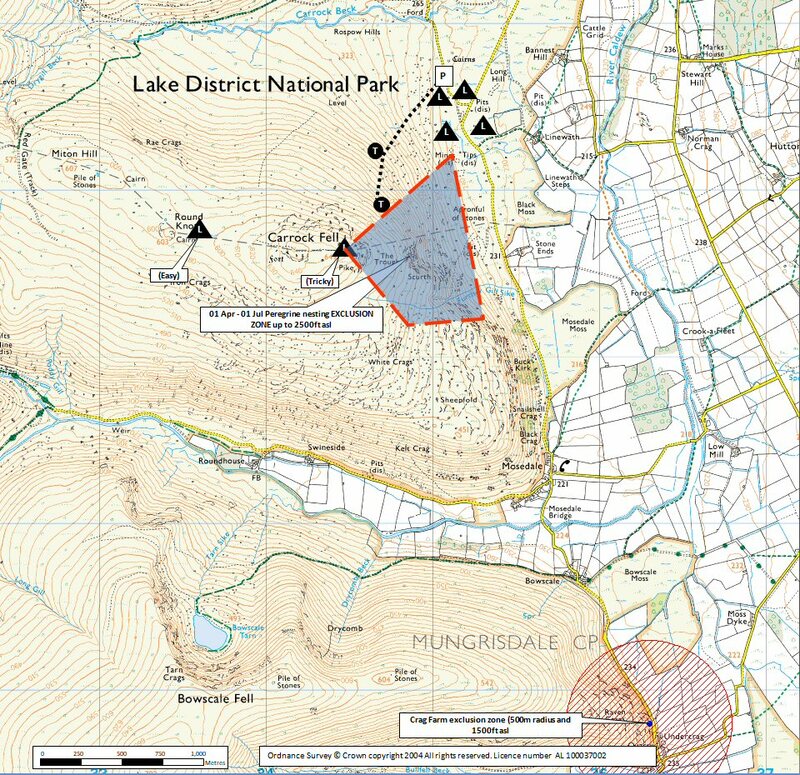 IF FLYING TOWARDS SOUTHER FELL DO NOT LAND IN FIELDS NORTH OF AND AROUND MUNGRISDALE AS THIS WILL POTENTIALLY LOSE US THIS SITE, AN EXCLUSION ZONE EXISTS AROUND UNDER CRAG FARM DO NOT FLY IN THIS AREA(500M RADIUS AND 1000FT @ NY 363308). Contact North Sites Officer for more information (07830281986). 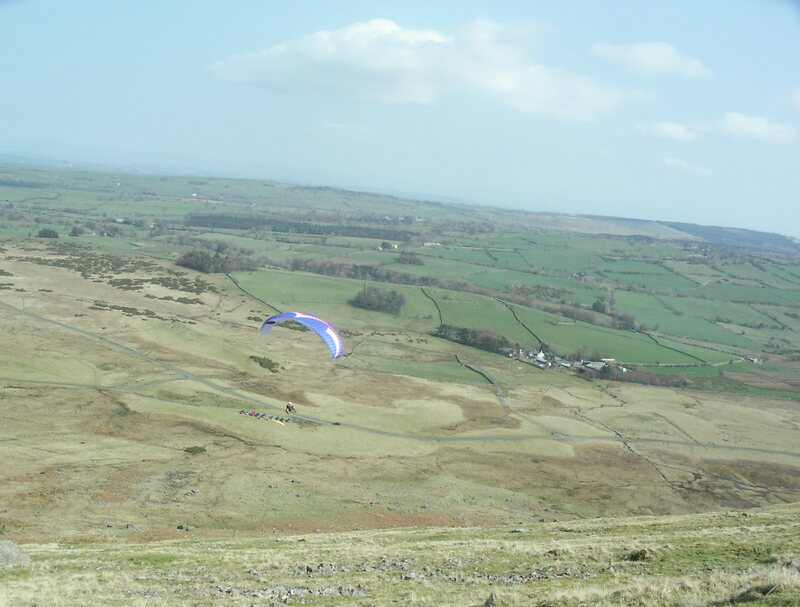 A large site that is renowned for its light winds when everywhere else is blown out. The site works really well and, excluding top landing, is a good introduction to the big sites of the Lake District. The carry up is not popular but in reasonable conditions only a few hundred feet are necessary. PLEASE READ RESTRICTIONS ON BRIEFING PAGE BEFORE FLYING. High House (on 1:25,000 map). Use this postcode with care as it will almost certainly take you the wrong way. The postcode centre is 3/4 mile 030 degs from car parking for Carrock. Take the main A66(T) Keswick to Penrith road. If travelling from Keswick, take the left turn onto the Mungrisedale road. If travelling from Penrith, take the right turn onto the Mungrisedale Road having passed the turning onto the A5091 to Dockray. Follow the minor road through the small hamlets of Mungrisedale and Mosedale (please drive slowly due to animals and children on the roads). Two kilometres beyond Mosedale the road forks at a triangular patch of land. The parking area is off the left hand side of the road at this fork. Please be considerate of others and park fairly close together. 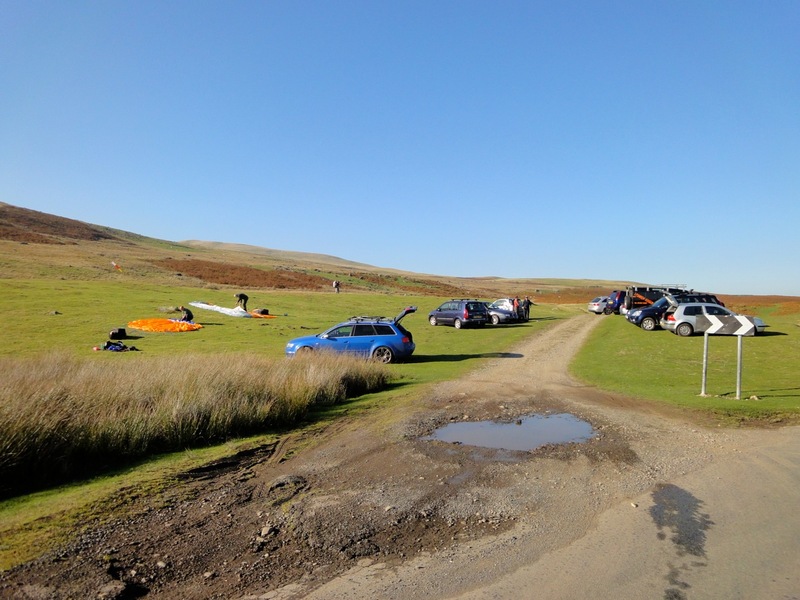 From the parking area, walk straight ahead to the fell crossing an area of boggy ground to reach the foot of the fell. There are a few sheep tracks that can be followed as you pick your way across the, often steep, broken ground. From this site the coast at Barrow has been reached, both by paraglider and hang-glider, as well as routes towards Cockermouth to the west. The site has produced conditions for large triangles over the flat land in front of the site. A view of the take off area looking south. The peregrine nesting area are the crags on the left of the picture. Photo by John Hamlett. The landing area at Carrock is the area before the cars on this side of the road. Photo by Pete Rycroft. Notes : Gained cloud-base (~5000�) above Carrock. Blencathra and Walla, and then no lift all the way to Crinkle Crags. Then on to Hardknott Pass via the Duddon Valley. 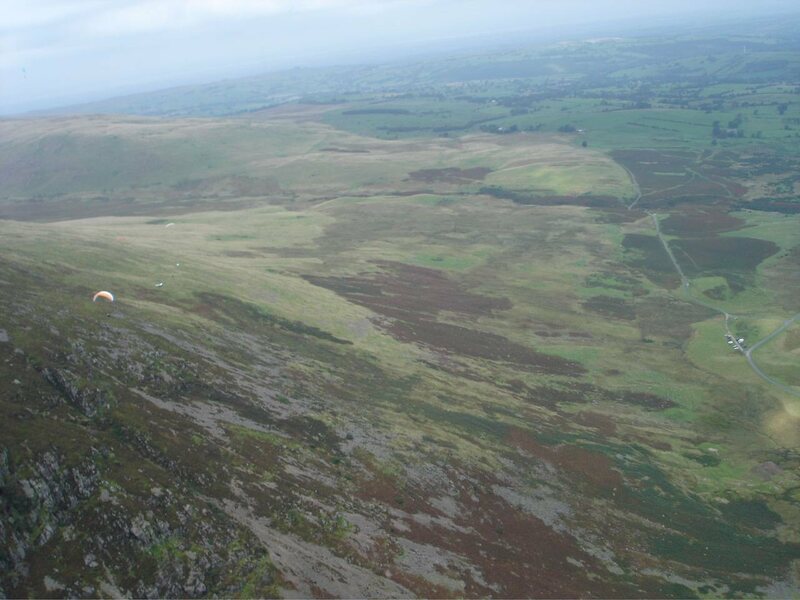 Regained cloudbase over Broughton and then all the way to Barrow-in-Furness.